Stage director, creator of happenings, painter, set designer, writer, art theoretician, actor in his own productions and lecturer at the Academy of Fine Arts in Kraków. Born in 1915 in Wielopole Skrzyńskie, in the province of Tarnów; died in 1990 in Kraków. Creator of his own theatre group and of productions branded with a poetic that he derived from a complicated private/public Galician origin and its consequences. Kantor was inspired by Constructivism, Dada, Informel art and Surrealism. He was attended the Academy of Fine Arts in Kraków and studied under Karol Frycz, an outstanding set designer of the inter-war period. Kantor staged his first productions - Jean Cocteau's Orpheus, Juliusz Słowacki's Balladyna and Stanisław Wyspiański's Powrót Odysa / The Return of Odysseus with an underground theatre company that gave performances in private homes. Immediately after the war he worked as a set designer, mostly for the Helena Modrzejewska Old Theatre in Kraków. Kantor continued to design for the stage on a regular basis throughout the 1960s, primarily working on abstract sets. A trip to Paris in 1947 inspired him to better define his own individual approach to painting, and a year later he founded the Grupa Krakowska / Cracow Group and participated in the Great Exhibition of Modern Art / Wielka Wystawa Sztuki Nowoczesnej in Kraków. But when Polish government authorities began to promote Socialist Realism as "official" art, Kantor disappeared from the art scene altogether. It wasn't until 1955 that he finally exhibited the paintings he had been creating since 1949. 1955 was an crucial year for Kantor for several reasons. It was the year that he inspired a group of visual artists, art critics and art theoreticians to help him create the Cricot 2 Theatre, which would become an incubator for his creativity. Cricot 2's first premiere was Mątwa / The Cuttlefish by Stanisław Ignacy Witkiewicz (1956), a production in which Kantor cleverly juxtaposed the work's sublime rhetoric against a host of found objects and the banal environment of a café. 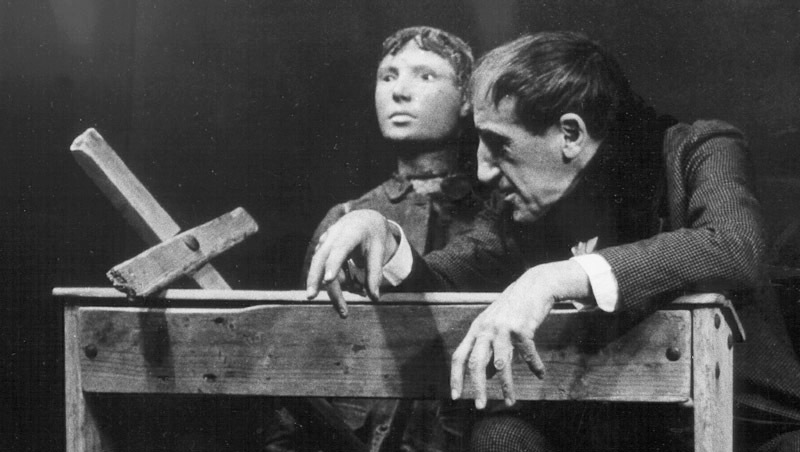 The production included many elements that were to become characteristic of Kantor's theatrical style, such as sets that suggest silent films and actors who move and act like mannequins. Cricot 2's second production was Cyrk / Circus, based on a play written by the company's own Kazimierz Mikulski, also a painter. It utilised a technique known as "emballage", which was also typical of Kantor's theatrical work at the time. In Circus, emballage took the form of black bags wrapped tightly around the actors. Such packaging was designed to strip actors and objects of any recognisable form, turning them into indistinguishable substance. Kantor's emballage period was followed by "Informel Theatre" (1960-62), a sort of automated spectacle that relied entirely on coincidence and the movement of matter. The actors in Kantor's Informel Theatre production of Witkiewicz's W małym dworku / Country House (1961) were treated like objects, entirely stripped of their individuality. However, Informel Theatre failed to fully satisfy Kantor. The form was insufficiently integrated in an internal sense and too many of its parts were open to reduction. Kantor therefore replaced the concept of Informel Theatre with that of "Zero Theatre" (1962-1964), which was completely devoid of any action or events. 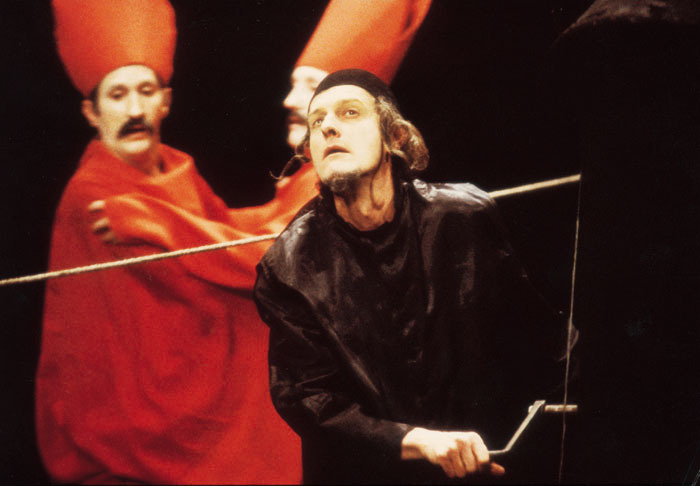 This idea was most fully embodied in Cricot 2's production of Wariat i zakonnica / The Madman and the Nun, also by Witkiewicz, which Kantor staged in 1963. In the evolution of his staging and aesthetics, Kantor had pushed the limits of any traditional concept of theatre. In 1965 he created Poland's first happenings - Cricotage and Linia podziału / Dividing Line - which were followed two years later by the famous List / The Letter and Panoramiczny Happening morski / Panoramic Sea Happening. Happenings, as Kantor himself wrote, were a product of his previous experiences in the theatre and as a painter. Up to this point, I have tried to overcome the stage, but now I have abandoned the stage outright; that is, I've abandoned a place whose relationship with the audience is always well-defined. In searching for a new place, I theoretically had all the reality of life at my disposal, he wrote. Throughout the world, Tadeusz Kantor is best known as an outstanding and highly original figure of 20th century theatre, as well as the creator of his own theatre group and of productions imbued with a poetry derived from the artist's own complex private/public Galician origin. In Poland he played a number of roles, primarily within the Cracow artistic community with which Kantor was emotionally and artistically connected, if not fused. He was one of the most important figures on the Cracow art scene, acting as an integrator. Immediately after World War II, Kantor was amongst those who created the Young Visual Artists' Group (1945); later, following the "thaw" of the mid-1950s, he once again demonstrated his penchant for organisation by helping to reactivate the pre-war Group (1957). He provided the impulse for the creation of the Krzysztofory Gallery, one of the first post-war galleries in Poland to exhibit contemporary art, and was involved in organising the 1st Modern Art Exhibition (Kraków, 1948). He played a dominating and commanding role in his community until he died, just before the premiere of his last theatrical production. It was titled, both ironically and symbolically, Dziś są moje urodziny / Today Is My Birthday. Kantor's life in the theatre began early, when, during the German occupation, he created an underground experimental theatre in Kraków. This theatre managed to integrate the artistic community of the city and it found a worthy successor in the Cricot 2 Theatre, formed in 1956. "Cricot 2" was a reference to the pre-war Cricot avant-garde visual arts theatre founded by Józef Jarema, a painter and member of the Paris Committee who emigrated during the war and remained abroad. Cricot 2's theatrical productions remain Kantor's greatest achievement. His early productions, based on the plays of Stanisław Wyspiański and Stanisław Ignacy Witkiewicz (Wariat i zakonnica / The Madman and the Nun (1963) and Nadobnisie i koczkodany / Dandies and Frumps (1972)) are held in high esteem and helped to popularise these plays, which are generally considered to be difficult. However, Kantor only gained international recognition with his later productions, many of which were inspired by the prose of Bruno Schulz. Remarkably, Kantor made reference to his own biography through these plays, reaching into the private archive of his memory (a theatrical form known as the Theatre of Death, which includes productions such as Umarła klasa / The Dead Class (1975), Gdzie są niegdysiejsze śniegi? / Where are Yesterday's Snows? (1979), Wielopole, Wielopole (1980), Niech sczezną artyści / Let the Artists Vanish (1985), Nigdy tu już nie powrócę / I Shall Never Return Here (1988) and Dziś są moje urodziny / Today is My Birthday (1991)). Regardless of whether he drew on a pre-existing work of literature or chose to develop the stage-play himself, Kantor designed complete and integrated productions for which he took total responsibility. He often participated directly in his productions, acting as "master of ceremonies", attentively observing the action and intervening when necessary. The shows, often thought to be the vision of a single artist, were replete with references to a complex and multi-cultural Polish history and iconography. They brought Kantor widespread recognition and transformed him into the godfather of a style of theatre that combines the visual perception of form with the need to convey a deep, personal, emotional message. Many of his productions have been inscribed in the annals of theatrical history. Carrying on Kantor's legacy, Cricot 2 Theatre Centres have been created in Kraków and Florence. In addition to studying Kantor's theatre, the latter also documents the artist's other activities and examines the reception and perception of his work. On Kantor's other, non-theatrical output, including his achievements as a painter, assessments vary. His vision of art was derived primarily from his search for a means of artistic expression worthy of the challenges of his era. Kantor expressed this idea as early as 1945, when he joined Mieczysław Porębski in publishing a manifesto on "exponential realism". In it, Kantor encouraged artists to take risks in the name of creative freedom, underlined the importance of experimentation and emphasised the need for the artist to remain independent from ideological and political pressures (he himself followed these guidelines by vanishing from public cultural life throughout the Socialist Realist period). Kantor strove to live by his principles in his own way; he absorbed any and all novelties, skilfully assimilating those which were useful to him while transforming and modifying them if necessary. For much of his career as a painter, Kantor acted simply as a medium, processing the artistic waves that reached Poland from Western Europe (he visited Paris in 1947). As a result, his painting was not entirely original. For a short time immediately after the war he painted figurative works filled with grotesquely simplified figures. The dreary atmosphere of these images was emphasised through their use of dark colours and rough textures (Kompozycja / Composition (1944-45)). This was followed by a period during which he produced dynamic metaphorical compositions characterised by an economical use of cool colours. These works resembled those of Maria Jarema and Jonasz Stern, who were painting similar things at approximately the same time (Ponad-Ruchy / Supra-Movements (1948)). During the second half of the 1950s, Kantor's work consisted mainly of energetically painted Tashist canvasses, as mentioned above. These images are visually mesmerizing in their own way, filled with vibrating spots of paint, lines and colours. But at the same time they convey the impression that the artist treats painting in a "utilitarian" manner (Oahu, 1957), although in his own writings, Kantor described these works as "secretions" of his inner self. Their originality did not go unnoticed by foreign critics, including those in France, which was home to the most significant critical milieu at the time. Towards the end of the 1950s Kantor exhibited his paintings in a number of Western cities, including Paris, with some measure of success. Later, the artist turned his attention toward creating numerous assemblages and "emballages"- half-spatial compositions in which pre-used, oftentimes destroyed objects like envelopes, bags and umbrellas were applied to the canvas, transforming the paintings into reliefs (Mr. V Prado - Infantka / Mr. V Prado - The Infanta, 1965 and Emballage, 1967). Figures keep reappearing in these paintings, but they are deformed, sketchily drawn or "hidden" under umbrellas in dynamic and symbolic gestures of self-defence (Ambalaz - Przedmioty, postacie / Emballage - Objects, Figures, 1967). Thus the umbrella, this lowly object that Kantor held in such high esteem ("a manifestation of a reality of lower status", he once called it), while unable to fulfil its original function, unexpectedly regains its utility in the world of art. Kantor's many painting series from the 1970s and 80s show clear links to his theatrical activities, which he was pursuing simultaneously. For example, while working on Umarła klasa / The Dead Class, which premiered in 1975, Kantor created a series of paintings of the same title. Later the artist would devote himself primarily to the theatre, resuming painting only in the last years of his life. These late works depict a solitary human figure, shown - in the style of new figural art - making a single "stage" gesture. Characterised by cool colours, these images draw heavily upon the artist's own personal experiences (see the series Dalej już nic / Nothing Beyond This (1987-88)). 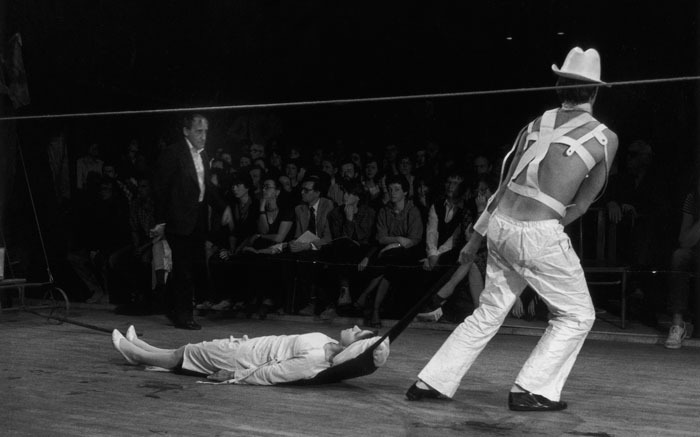 Alongside his other work, Kantor also organised of a series of paratheatrical actions that would anticipate much of the polyphonic art of the 1960s and '70s. Among these were his environments (the anti-exhibition titled "Wystawa Popularna" / "Popular Exhibition" at Krzysztofory Gallery in Kraków (1963)) and numerous happenings (Linia podziału / Dividing Line, Krzysztofory Gallery (1966); Panoramiczny happening morski / Panoramic Seaside Happening, Plener Koszaliński w Osiekach / The Koszalin Plein-Air Meeting in Osieki (1967); List / The Letter, Foksal Gallery, Warsaw (1968) and Lekcja anatomii wg Rembrandta / An Anatomy Lesson According to Rembrandt, Nuremberg Kunsthalle (1968) and Foksal Gallery (1969)). 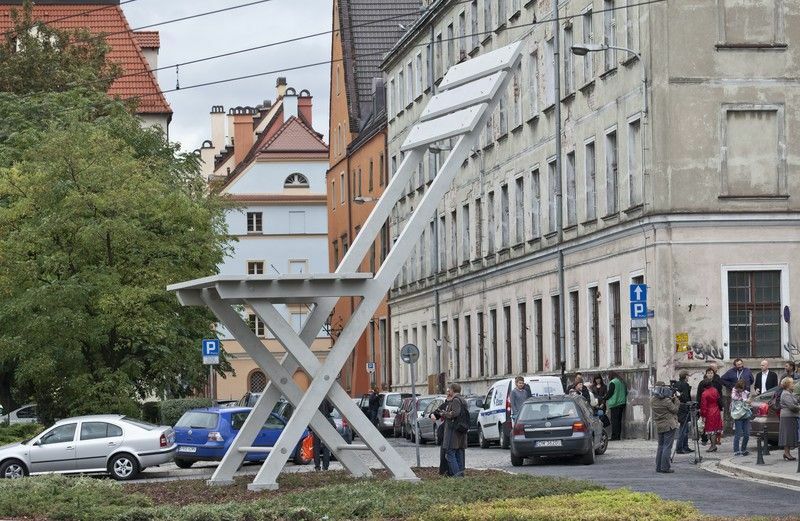 Kantor also went through a period of fascination with Conceptualism (see Wielkie krzesło / The Great Chair designed for the 1970 Wrocław Symposium). A wealth of literature has been devoted to Kantor as an artist. Noteworthy titles include Wiesław Borowski's Tadeusz Kantor (1982), Mieczysław Porębski's Deska / Wooden Board (1997) and a volume of studies by various authors titled W cieniu krzesła / In the Shadow of the Chair (1997), as well as documentation of the painter's collaboration with Warsaw's Foksal Gallery (1999).